Objectives: Report the exploratory study results of the performance of a conventional solar still prototype using seawater and brackish water (river and well) at three locations in northern Chile at different geographical heights. Materials and methods: A solar still with an effective distillation area of 0.54 m2 was used. Three tests were performed with seawater, 1 with river water and 1 with well water. The temperatures and environmental parameters were measured every 10 minutes for 36 continuous hours. The efficiency was evaluated in terms of seawater and the capacity to remove natural contaminants from brackish water. Results and discussion: The productivity in the three selected areas was 3 and 4 L/m2 for seawater and brackish water, respectively. The removal of boron and arsenic complies with the regulations of the country. 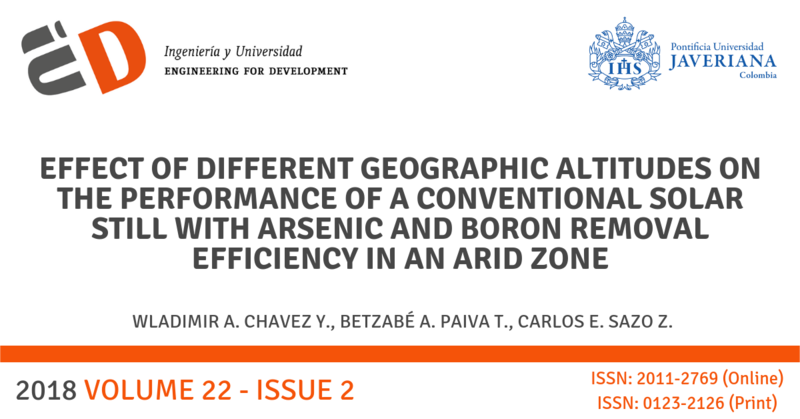 Conclusion: The results obtained are of exploratory character for the zones, where the geographic height and the total dissolved solids are factors that determine the performance of a passive solar still, which is higher when water is used with low concentrations of solids. V. Herrera, C. Carrasco, P. Sandoval, C. Cortés, Transferencia de arsénico en el sistema aguasuelo- maíz de zea mays l. cultivados en la quebrada de Camiña, norte de Chile. Revista de la Sociedad Química del Perú, vol 83(1), 2017. Comisión Nacional de Energía, Programa de las Naciones Unidas para el Desarrollo, Global Environment Facility, Universidad Técnica Federico Santa María, Irradancia Solar en Territorios de la República de Chile, Santiago de Chile, 2008. Pr.K. Abdenacer, S. Nafila, Impact of temperature difference (water-solar collector) on solar still global efficiency, Desalination 209 (2007) 298-305. J.G. Hirschman, A solar energy pilot plant for northern Chile, Solar Energy, 5 (2) (1961) 37-43. A. K. Kaviti, A. Yadav, A. Shukla, Inclined solar still designs: A review, Renewable and Sustainable Energy Reviews, Vol 54 (2016) pp. 429-451. D. W. Rufuss, S. Iniyan, L. Suganthi, P.A. Davies, Solar stills: A comprehensive review of designs, performance and material advances, Renewable and Sustainable Energy Reviews, Vol 63 (2016) pp. 464-496. K.K. Murugavela, Kn.K.S.K. Chockalingama, K. Srithar, Progresses in improving the effectiveness of the single basin passive solar still, Desalination 220 (2008) pp. 677-686. Z.M. Omara, A.E. Kabeel, M.M. Younes, Enhancing the stepped solar still performance using internal reflectors, Desalination 314 (2013) pp. 67–72. Chang-Dae Park, Byung-Ju Lim, Kyung-Yul Chung, Sung-Soo Lee, Young-Man Kim, Experimental evaluation of hybrid solar still using waste heat, In Desalination, Volume 379 (2016) pp. 1-9. S. Abdallaha, O. Badranb, M. Abu-Khader, Performance evaluation of a modified design of a single slope solar still, Desalination 219 (2016) Issues 1–3, pp. 222-230. K.V. Kumar, R.K. Bai, Performance study on solar still with enhanced condensation, Desalination 230 (2008) 51–61. R. Samuel Hansen, K. Kalidasa Murugavel, Enhancement of integrated solar still using different new absorber configurations: An experimental approach, In Desalination, Volume 422 (2017) pp. 59-67. O. Ansari, M. Asbik, A. Bah, A. Arbaoui, A. Khmou. Desalination of the brackish water using a passive solar still with a heat energy storage system, Desalination 324 (2013) pp. 10–20. M. Abu-Arabi, Y. Zurigat, Year-round comparative study of three types of solar desalination units, Desalination 172 (2005) pp. 137-143. T. Abderachid, K. Abdenacer, Effect of orientation on the performance of a symmetric solar still with a double effect solar still (comparison study), Desalination 329 (2013) pp. 68–77. B. Bouchekima, A small solar desalination plant for the production of drinking water in remote arid areas of southern Algeria, Desalination 159 (2003) pp. 197-204. A.A. El-Sebaii, Effect of wind speed on some designs of solar stills, Energy Conversion and Management 41 (2000) pp. 523-538. A. Hanson, W. Zachritz, K. Stevens, L. Mimbela, R. Polka, L. Cisneros, Distillate water quality of a single-basin solar still: laboratory and field studies, Solar Energy 76 (2004) pp. 635-645. S. Aboul-Enein, A.A. El-Sebaii, E. El-Bialy, Investigation of a single-basin solar still with deep, Renewable Energy 14 (1-4) (1998) pp. 299–305. J. Karlsson, A. Roos, Modelling the angular behavior of the total solar energy transmittance of windows, Solar Energy 69 (4) (2000) pp. 321-329. G.N. Tiwari, J.M. Thomas, E. Khan, Optimisation of glass cover inclination for maximum yield in a solar still, Heat Recovery System and CHP 14 (1994) pp. 447-455. A.K. Singw, G.N. Tiwari, P.B. Sharma, E. Khan, Optimization of orientation for higher yield of solar still for a given location, Energy Conversion and Management 69 (1995) pp. 175-187. A.K Tiwari, G.N. Tiwari, Effect of water depths on heat and mass transfer in a passive solar still: in summer climatic condition, Desalination 195 (2006) pp. 78-94. R. Tripathi, G.N Tiwari, Thermal modeling of passive and active solar stills for different depths of water by using the concept of solar fraction, Solar Energy 80 (2006) pp. 956-967. N.H.A. Rahim, Utilisation of new technique to improve the efficiency of horizontal solar desalination still, Desalination 138 (2001) pp. 121-128. M.K. Phadatare, S.K. Verma, Influence of water depth on internal heat and mass transfer in a plastic solar still, Desalination 217 (2007) pp. 267–275. J. Duffie, W. Beckman, Available solar radiation, in: Solar Engineering of Thermal Processes, Madison, Wisconsin, John Wiley & Sons, INC., 1980, pp. 3-147. S.M. Radwan, A.A. Hassanain, M.A. Abu-Zeid, Single slope solar still for seawater distillation, World Applied Sciences Journal 7 (4) (2009) pp. 485-497. National Oceanic and Atmospheric Administration, National Aeronautics And Space Administration, United States Air Force, U.S. Standard Atmosphere, U.S.A , Washington D.C., 1976. N. Schulz, J.P. Boisier, P. Aceituno. 2011, Climate change along the arid coast of northern Chile, International Journal of Climatology, 32: pp. 1803–1814. P. Cereceda, H. Larrain, P. Osses, M. Farías, I. Egaña, 2008. The climate of the coast and fog zone in the Tarapacá Region, Atacama Desert, Chile, Atmospheric Research 87, pp 301– 311. S. Davis, R. DE Wiest, 1967, Hidrogeologia, Ed Ariel, Barcelona, España. R. Arun Kumar, G. Esakkimuthu, K. Kalidasa Murugavel, Performance enhancement of a single basin single slope solar still using agitation effect and external condenser, In Desalination, Volume 399 (2016) pp. 198-202. Nader Rahbar, Javad Abolfazli Esfahani, Amin Asadi, An experimental investigation on productivity and performance of a new improved design portable asymmetrical solar still utilizing thermoelectric modules, In Energy Conversion and Management, Volume 118 (2016) pp. 55-62.
 WHO, Domestic Water Quantity, Service, Level and Health. (2003), pp. 9.
 WHO, Guías para la calidad del agua potable 3° ed. (2004) pp. 255-267. NCh 1333/ of 78. Requisitos de la calidad del agua para diferentes usos. Chile, (1987). NCh 409/1.Of. 2005. Agua Potable - Parte 1: Requisitos, que establece los requisitos de calidad que debe cumplir el agua potable en todo el territorio nacional.